According to Statista, the average marketing email open rate is less than 15%. This abysmal performance isn’t because people don’t want to open emails. They signed up for a reason. They haven’t unsubscribed. You can clearly attribute it to your email communication skills. Better communication equals better email. That’s open rates in the 20’s or higher. That’s increased conversion rates. That’s more return on your email marketing budget. Let’s explore actionable ways you can start creating more powerful email today! When you think of email communication, your mind might first go to newsletters. If so, you’re not alone. 74% of businesses say that this is their primary email communication strategy. It’s a single, solid method to communicate with customers. But if you’re only focused on this one delivery style, you’re not leveraging email to get results. A comprehensive email marketing strategy goes beyond the newsletter. It maximizes customer experience with every inbox touch point. It engages people in different ways at the various stages for the buyer’s journey. It allows you to react instantly. Take advantage of those fleeting opportunities. A comprehensive email communication strategy is about foresight, automation and effective communications. A critical step to creating better email is understanding the roles that each of these email types play. The purpose of a newsletter is to nurture relationships with both existing customers and your highly qualified leads. It offers content that is relevant to your target. It solves a problem. It keeps them informed. It demonstrates your expertise. Its goal may also be to entertain. It focuses on the target’s needs by providing valuable information. In return, you keep that subscriber. You stay top of mind with that person. Additionally, analyzing newsletter data can give you great insight into your target’s interests, goals, preferences and more. You can apply this knowledge to hone your communications across platforms. The event trigger or auto-responder could serve to meet a series of objectives. Its over-arching goal is to immediately engage someone. The average attention span is now fewer than 10 seconds. As a small business, you don’t have time to browse through your inbox, then compose an email. The opportunity has passed. Each of these events represents a pivotal moment in your relationship with the customer. This moment may either not occur or happen against your favor without an instant response. According to Constant Contact, up to 60% of people open welcome emails. This makes the welcome email the most opened email you’ll ever send out. And yet nearly 1/2 of small to medium businesses never update their welcome emails. They may even leave them on the default: “Thanks for subscribing”. Give people a first glimpse of what makes you unique. Reward people for subscribing. Give them a next step in the form of a call-to-action. For higher price point business, make this a showcased article, entering of a preference or signing up for a free trial. This furthers the buyer’s journey when they aren’t ready to buy. If you have lower to medium price points, offering a special discount is often effective. These fall into event triggered but deserve their own category. Remarketing (also sometimes called retargeting) allows you to recapture a missed opportunity. One of the most important remarketing emails is the abandoned shopping cart email. A Baymard Institute study showed that 60% of people abandon their cart because the final total is higher than the expected. That’s because of shipping and taxes can usually only be calculated at the end. 70% of customers who are effectively retargeted return to their carts to complete the purchase. 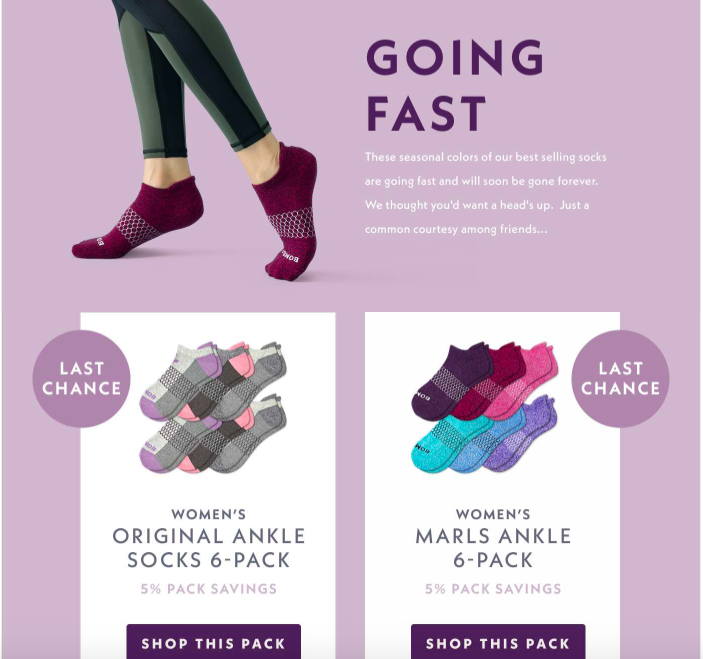 As a small ecommerce business, you probably can’t afford to offer free shipping on every order. But it’s often worth it to keep the customer. Reviews are vital to the health of a small business. 90% of people now read at least 10 reviews before making a purchase. 90% say a review is as trustworthy as a personal recommendation from a friend. 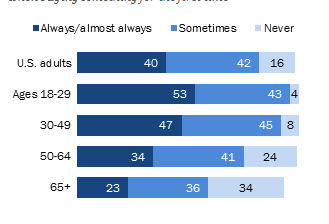 From Pew Research here’s the breakdown of review usage by age. Fewer than 10% of customers write reviews when they make a purchase. And unhappy customers are 2-3X more likely to write you a review than happy ones. Yet 70% of people will leave a review if a person asks them to. Should you be asking for reviews? Yes, and email is one of the most effective ways to do it. A clear call to action. Where do you want them to review you? A/B testing will help you earn more positive reviews. Test different subject lines, messages and designs. Find out what works best. But what if they write you a bad review? You may be worried. Know that 87% say they’re suspicious if they don’t see any 2 to 3-star reviews. Yes, bad reviews can hurt. But if you’re taking care of customers and asking for reviews, great reviews will far outweigh them. It only takes 12 reviews to cancel out a bad one. Surveys are an incredibly important tool. People love to give their opinion. But this is counter-balanced. Customers often feel that surveys are a shallow attempt for business to show they care. An effective survey request must counteract this by demonstrating the value of the customer opinion. Send 1 reminder follow-up if you don’t get a response. Then actually use the information you acquire to improve the customer experience. As you do, you’ll get greater participation. You can’t really call your email communication effective if it ends up in the spam folder. It’s not always unavoidable. But there are some clear tactics to avoid if you want to stay in the inbox. Don’t put subject lines in ALL CAPS. You’re not getting anyone’s attention. Avoid multiple !!! no matter how happy you are. Don’t use buzz words like “free”, “act now”, or “urgent”. These may have worked at one time. Now, they’ll get you junked. Excessive use of image space with little text or vice versa. Poor formatting. …No, you shouldn’t copy paste a Word document into an email. It makes an HTML mess. What happens if a specific recipient never opens your emails? Answer: They will begin going to spam/junk. If you’re currently engaging in ineffective email communication, stop it immediately. You could be doing more damage than you think to your subscriber list. Once done, this damage is hard to reverse. But if you start applying these strategies to craft better email, you can turn this ship around. According to the Digital Marketing Association’s research 77% of ROI generated through email comes from segmentation. If you’re not segmenting, you can’t maximize your marketing budget. Being generally relevant no longer cuts it. People only open email when they can instantly tell that it will specifically benefit them. That’s where segmentation comes in. How can you be more relevant to your target customers? Let’s look at some of the most common ways emails can be segmented. Knowing where your customers are, helps you tap into weather patterns. You’re not talking to Wisconsoners about opening up the swimming pool in April. But you would be if the customer is in Mississippi. Someone in Texas isn’t likely to know what a roof rake is. But someone in Maine would. Tap into large area celebrations, sporting events, and shared qualities. People in different age groups may respond to different language, challenges, images and offers. Segment by age to communicate in their language. We don’t want to go over-board with gender stereotypes. But there are times when segmenting by gender makes sense. If you’re a razor, hygiene, or clothing company, you likely have products for each gender. You don’t just have one target customer. Within that broader group, you have different needs, goals, and emotional triggers. Segment these groups based upon survey results to make email communication that’s much more relevant. This may seem like a crazy amount of work. It can be if you don’t have a plan. But start breaking things down. You’ll find you can create content. You can then make small changes for each segment. Track and compare segment engagement rates as well as conversion rates. If a segment is lagging, see what you can do to better engage them. You may have some people in the wrong segment. You’ll find that certain segments respond better to emails on certain topics or in certain formats. Some may enjoy a greater or lesser frequency. Make note of these preferences at the segment level. If it increases conversion rates and revenue, it’s well worth diversifying your email assets. His point was that a much larger number of people will see your headline than view the copy. It determines whether they continue. The subject line deserves your respect. It’s not an afterthought. We don’t have to guess about what makes a great subject line. MailChimp conducted a massive study. Here’s what they found. On average, personalized subject lines have a 50% greater chance of being clicked than the same subject line without. And yet 90% of emails don’t have a personalized subject. That gives you a huge competitive advantage. Personalization can mean using the person’s name. It can also be demonstrating that you know something about the person. Such is the case with remarketing and auto-responders that we discussed earlier. They notice you because you’ve just become more relevant. We can’t say that 40 characters get this % and 50 get that. But we know with certainty if devices are cutting off your title, this lowers your click rate. If you can say it in 20-30 characters do so. Don’t go over 50 or you’ll certainly get cut off. If you must go over, all important characters should be at toward the beginning. 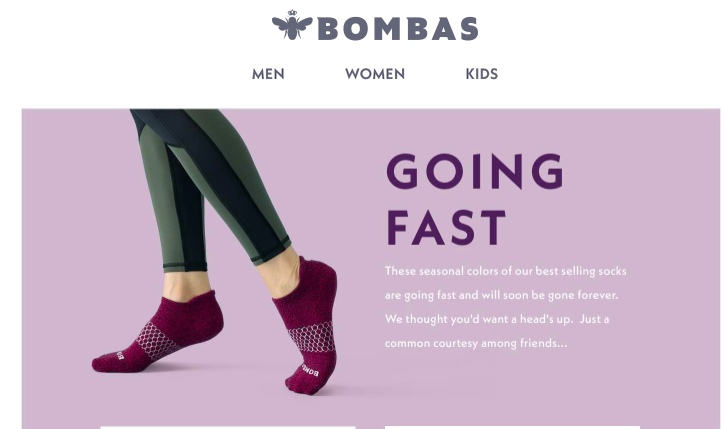 Check out this concise yet clickable subject from the sock company Bombas that donates a pair when you buy a pair. It evokes emotion and FOMO (Fear of Missing Out). You instantly want to click it. What do you want people to do because of this email? Reflect this in your subject line. It’s an old-school marketing trick. But it still works today. Make people feel like they may miss out on something if they don’t click. Don’t overdo it. But strategically placed numbers get noticed. Our brains are wired to believe that numbers are the most important part of what we’re reading. We’re drawn to them. Are you using APA or Chicago style formatting rules because you think it’s more grammatically correct? You may be seriously hindering your email communication effectiveness because they limit the use of digits. Special characters in moderation can have a similar effect in that they often cause a double-take. People instinctually want to respond to questions. Give the recipient question that provokes thought. Give them a question that shows you value their opinion. Give them a question that makes them wonder if you have the answer. A Neilsen Study used heat-mapping technologies to track eye movements. They wanted to understand how people read blogs, emails, and other similar materials. You may think of a person reading the first paragraph. Then they keep going if they’re interested. But that’s not how our brains work to decide whether an email communication is worth reading or not. We’re much more efficient. The average person reads copy in an “F” pattern. They read across the top. They then read the next line or sometimes a few lines down. If they’re still interested, they then skim down the page. If something grabs their attention, they’ll read that section. Think of your customers as expert skimmers. The typical person can do this in 5-10 seconds. They only stay longer if there’s a section worth reading. How can you use this F pattern to your advantage? Use bolded headings that entice and/or clearly tell people what a section is about. Even a 200-word email can have 2-3 sections. Short left-aligned headings are best. Readers of English and other left-to-right languages skim on the left. They may not even read the whole heading if it goes across the page. Use short sentences and paragraphs. This is called “creating white space”. Large blocks of text are less likely to be read. Use readable, appropriately sized fonts. Studies have shown that people linger on fonts 14 and smaller. If people linger on a word, that means they’re not reading. They’re stuck. They’re having trouble physically deciphering the print. They won’t comprehend what they’ve read. Don’t forget the preview pane. On many modern devices and desktops, people view the top of the email in addition to the subject. This makes those top of your email prime real estate. Use it wisely. This real estate size varies. But you can think of as the first 3 inches vertically. This part of your email communication should pack a punch. Treat it as if it’s the only thing the recipient will read or see. Bombas does this very well. Here are the first 3 inches of one of their latest emails. You instantly know who this email is from with a prominent logo. A compelling graphic of socked feet draws the eyes. The headline is short and to the point. It conveys urgency and potential to miss out. The copy in clear and concise. It’s smaller than we’d recommend. The colors, lavender and violet, make this the perfect springtime color scheme. We discussed that people read in an F pattern and that the top 3 inches are prime real estate. Now let’s look at how this comes together in graphics. The F patterns not only applies to words. People also are more likely to see graphics that are around the top of that F. Think of the top of the F as the first half of the page. Within that top half, you need a compelling image, your logo and a must-click preview button. This placing makes them one of the first things people see. Video is a great way to connect with your email recipients. But there are some right and wrong ways to do video in your email communication. Video is impactful because it’s something special. Video can slow down your email load time and use more data. This will alienate recipients who don’t have the latest devices or unlimited data. On top of this fact, studies have shown that only 25% of people will watch to the end of video. This narrows your conversion potential significantly. Only 25% get to the end where the call to action is. Now, if you have a 10% conversation rate, it’s 10% of that 25%. You can counter this by making your videos short. Less than 3 minutes is ideal. You can also include clear calls to action at around the 20% mark. Videos should always hit the ground running. 19th century-style slow buildup doesn’t work. That first 5-10 seconds should instantly inform and/or entertain. Videos generally show a random and unflattering still. Choose an image that makes people want to click the video. Smiling faces and images that build trust work best. You may consider a more discreet CTA. You don’t want to annoy. But people refer a clear call-to-action. People prefer effective email communication. It shows you have nothing to hide. Add an Urgency Word if the CTA is short for even greater impact. “Stop Hunger Now”. Once again, prime real estate matters. In the case of a CTA, that’s the top of your page. Designers call this “above the fold”. The majority of people don’t scroll down a page. Effective email communication includes a CTA that is toward the top. A drip campaign is a very effective email communication type. It is defined by sending out a series of automated emails that build on each other. Each one is very short, increasing the chance that someone will read it. You take a basic lead — someone who signed up for emails. You nurture them into a highly qualified lead. Here’s an example of how you might do this. I’m the founder of Corporate Events Planner. We’ve helped local businesses like Law Firm and Medical SupplyCompany plan memorable employee events on a budget. What would be the best way to schedule 15 minutes of your time to explore how this service could help you boost employee morale, retention and productivity. My company, Corporate Event Planner, can help you boost employee morale, retention and productivity through events that employees and your budget will love. When would be the best time to schedule some time to talk? I want to make sure you saw my last two emails. I’d like to learn more about your business objectives and employee challenges. If you’re the right person to speak with, when would be a good time to schedule 15 minutes to talk next week? If you’re not the right person, who would you recommend that I speak with? Powerful email starts with understanding your email assets and diversifying your portfolio. Then optimize every aspect of that email to maximize open rate and conversions. Are you struggling with how to create better email? Contact us today! Get a FREE Email Marketing eBook.